Give your lifting operations a boost by investing in our 34mm 6×36 stainless steel wire rope, available in various diameters. The 34mm thickness of this product in particular will provide impressive performance potential along with long lasting resilience to moist conditions. The most important aspect of this wire rope, aside from its strand configuration, is the fact that it can be ordered with either a fibre core or an independent steel wire core. The 65,863kg load capacity of the latter core may be higher, but you sacrifice a degree of flexibility to get this strength. Meanwhile the 61,052kg WLL of the fibre core rope should suit some lifting purposes, while perhaps being slightly too low for certain customers. Since stainless steel does not rust like other metals, you can rely on this rope to stay in one piece for years, even if used outdoors or in maritime environments. In our stainless steel rope range, strand configurations of different types are offered. You can even get compacted rope made from this material, producing a smoother finish and also offering increased strength without boosting the diameter. Our wire rope products include galvanised rope and plastic coated rope, demonstrating the different treatments and techniques used to prolong the lifespan of lifting assemblies. Harness our enquiry form or give our team a ring on 01384 78004 if you want Rope Services Direct to give you advice and extra product information. 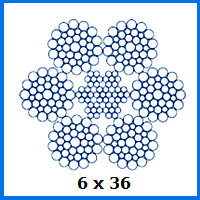 34mm 6x36 Stainless Steel Wire Rope Overall rating: 5 out of 5 based on 6 reviews.